The duplication process uses CD-R drives that are similar to the drives found in most home computers but our production lines contain many of these CD-R drives. The information is burnt onto one of Sony’s high grade CD-R discs and CD-R duplication orders of up to 500 copies can be achieved within 24 hours. 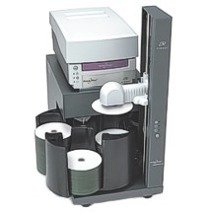 This is a quick, reliable and relatively cheap method of producing very high quality short run CD duplication orders. Our audio CD duplication service is available throughout the UK and turnaround times are listed on this site. CD duplication turnaround times vary depending on the type of CD printing and which packaging or cases are chosen. If you require further information regarding our audio CD replication or CD ROM duplication service please feel free to contact us.